GrandWay 6783 T is a straight clip point folding blade knife made of high quality stainless steel with gray protecting coating. This folder combines a modern technical design and time tested functionality. The blade is spring assisted, has a jimping, flipper and thumb stud that enables one-hand opening. The blade is reinforced with the fuller holed to lighten its weight. The knife handle is 2 steel connected liners with black textured G10 material inserts on both sides that provide a non-slip surface for comfortable and stiff grip. There is a metal spacer with the glass breaker on the end of the handle for any emergency. One side has a clip for carrying on the pocket. 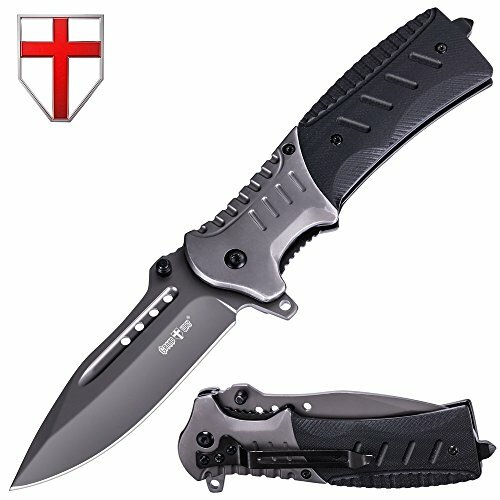 EDC FOLDING KNIFE WITH CLIP POINT BLADE, POCKET CLIP AND GLASS BREAKER. Has a simple and reliable liner-lock that is resistant to dirt and prevents blade fold. It is opened with the double sided thumb stud. PERFECT KNIFE FOR EVERYTHING - Camping, Fishing, Hunting, Backpack, Survival, Self Defense, Military, Combat, Emergency, Bushcraft & DIY Activities. TITANIUM NITRIDE (TiN) COATING OF 440C STAINLESS STEEL - an extremely hard ceramic material is used to improve the surface properties and to harden knife. It also enhances the look of the knife and gives additional protection against corrosion. COMFORTABLE AND LIGHTWEIGHT CONSTRUCTION - sharp, light and flat knife. Sturdy ergonomic black G10 handle with non-slip design perfectly fits in hands. Could be the best knife in your camp or hunt knife set. 100% MONEY BACK GUARANTEE - rest easy because your new knife is protected by Grand Way 10-year warranty. Could be a perfect gift for the man or woman in your life.